Why is our forest stressed? Increased nitrogen pollution is a severe anthropogenic stress factor for Swiss forests. 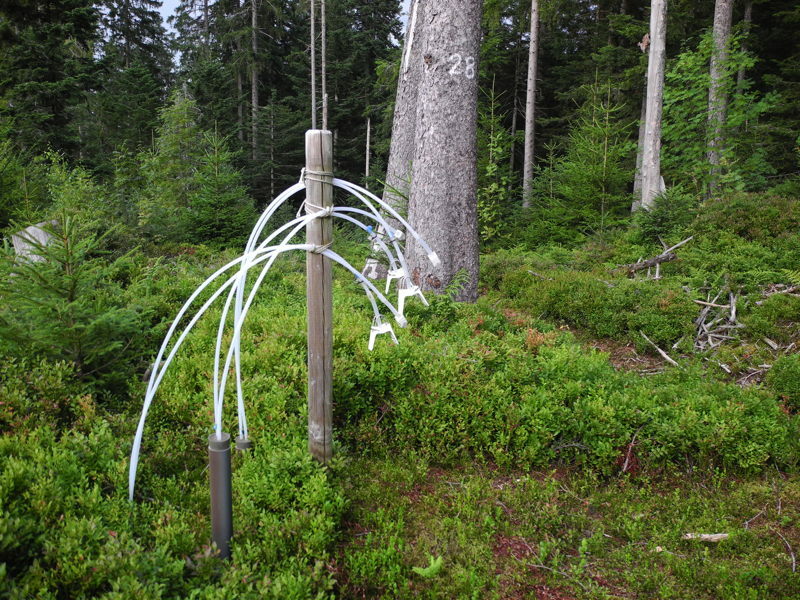 The input of nitrogen compounds via air into forests has almost been triplicated since the fifties of the last century and clearly surpasses a deposition of 30 kg nitrogen per hectare and year in several regions. However, forests can only support 10-20 kg nitrogen per hectare and year without adverse consequences in the long term (Critical Load). Left: Two thirds of total nitrogen deposition into forests originate from agricultural activities. 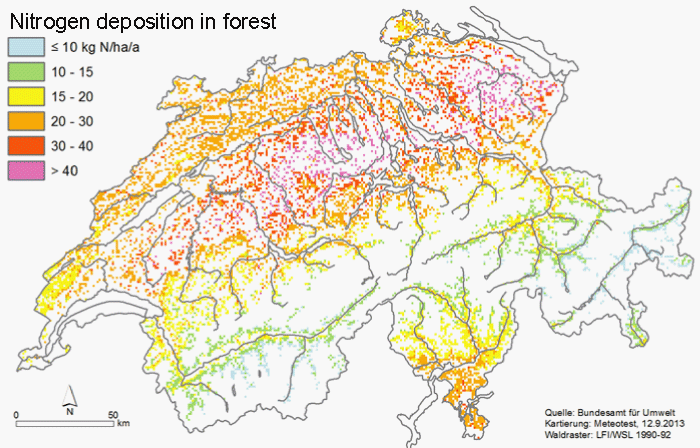 Right: Modelled nitrogen deposition into Swiss forests in 2013. The leaching of nitrate to the ground water is an indicator for nitrogen saturation of an ecosystem. Forest ecosystems are regarded as nitrogen saturated when more than 4-5 kg nitrogen in lowlands and more than 1-2 kg nitrogen per hectare and year in mountains are leached. 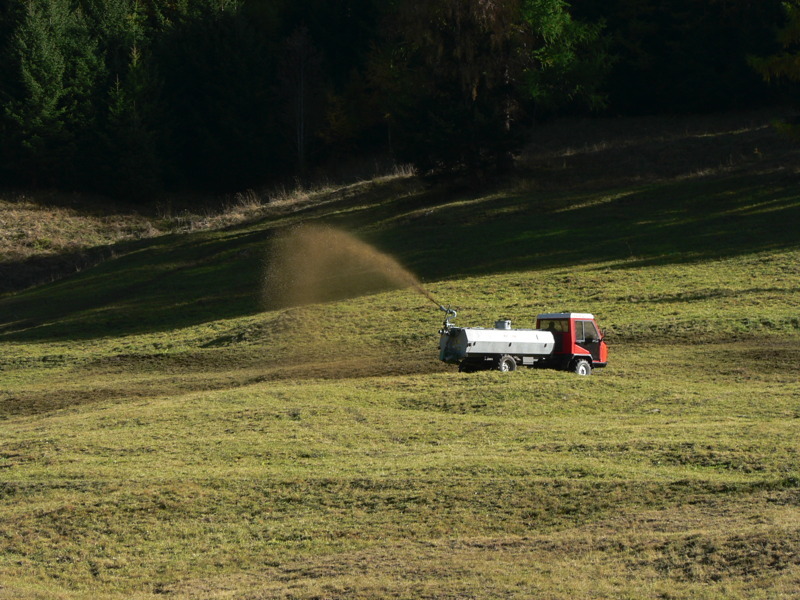 In plots on the Swiss Plateau, leaching rates between 11 and 33 kg nitrogen per hectare and year are measured, in the prealps between 7 and 25 kg and in southern Ticino about 54 kg, respectively. Therefore, in 58% of the forest observation plots, nitrogen deposition is higher than the Critical Load of 10-20 kg nitrogen per hectare and year. A lysimeter used to investigate nitrate leaching via soil water. Nitrogen deposition promotes tree growth up to a certain extent. However, aboveground biomass is more stimulated than belowground biomass. Consequently, water and nutrient uptake is impaired, tree stability is reduced and drought sensitivity increased. Moreover, the relationship between growth and nitrogen input is non-linear. In places where nitrogen deposition exceeds 25-30 kg nitrogen per hectare and year, growth even decreases. Reasons are nutrient imbalances created by the negative effects of increased nitrogen deposition, most probably on the symbiosis between trees and mycorrhizal fungi. In our experimental sites, depending on soil conditions, foliar phosphorus, potassium and magnesium concentrations are decreasing with increased nitrogen fertilization. For spruce we also found a relationship between nitrogen deposition and mortality. During drought periods, spruce trees die more often in plots with high compared to low nitrogen deposition because bark beetles more often attack them. The IAP is involved in the evaluation procedure of the UNECE and in the creation of a background document on the effect of nitrogen deposition on ecosystems.